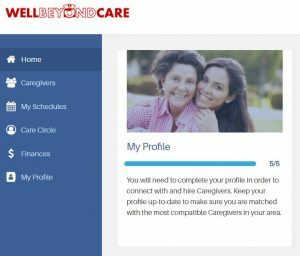 Well Beyond Care is the only company that teaches families and individuals how to find and manage affordable non-medical in-home care, while solving the chronic problems of caregiver truancy and turnover. The platform uses the power of the internet to offer families the ability to care for their aging parents from a distance, allowing them to safely age-in-place. The company also provides nurses to help with healthcare resources, support and transition care in and from the healthcare community in an effort to avoid emergent visits, hospitalizations and nursing home placement. This solution lowers stress when hiring a caregiver and saves families on average $10,000 to $30,000 per year in care costs. Both Careseekers and Caregivers can create a fee account now. What makes Well Beyond Care unique is that there is no more posting and replying to jobs. Instead, the company uses a sophisticated matching algorithm to ensure that the best caregivers are matched with the care needs of the care recipient. This is just one of the many innovations the company has developed in the three years since it first prototyped its caregiving service.